Looking for the perfect way to make an avocado wrap, or use up some leftover guacamole with a wrap sandwich? 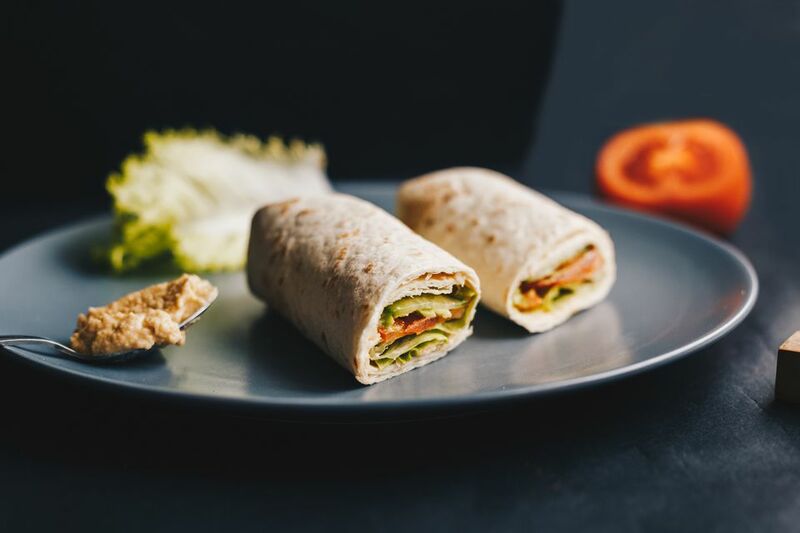 Try this healthy vegan California-style avocado hummus wrap sandwich recipe with hummus, avocado, and sprouts. Avocado toast may be the latest food trend, but vegans and Californians who love avocado have been adding avocado to sandwiches, toasts, and wraps for decades. Here's the perfect way to make a simple, healthy avocado wrap for lunch. You can use vegan cream cheese in your wrap, but the hummus is much healthier and less processed, and just as tasty. And you can add some pickles or pickle relish as well. If your flour tortillas have been in the fridge, bring them up to room temperature by either letting them sit out for an hour or two or by popping them in the microwave for just a few seconds (ten seconds, tops). Spread the hummus down the center of a flour tortilla. Arrange other ingredients on top of hummus and wrap it up for a quick vegetarian and vegan hummus sandwich wrap.